Broken Ground by Val McDermid is the very highly recommended skillfully plotted police procedural set in Scotland featuring Detective Chief Inspector Karen Pirie of the Historical Crimes Unit of the Edinburgh Police. A married couple is on a treasure hunt in a Scottish Highland peat bog. Based on a map made in 1944 by her grandfather, the two hope to unearth two vintage American motorcycles he and a friend buried. With help from the landowner, they unearth one motorcycle, but when start to uncover the second, they find a body. The body is well preserved from the peat bog and once it is quickly determined that the body is from a more recent time, 1995 rather than 1944, DCI Karen Pirie from the historical Crimes (cold case) Unit is called in to investigate. 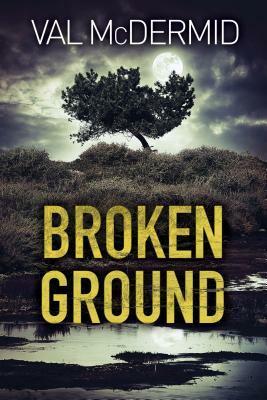 Broken Ground features the peat bog case, but it also has several other on-going cases that Karen and her young sidekick Jason are investigating. There is also a healthy dose of interoffice politics with a boss who is out to sabotage Karen and in that attempt has assigned a snitch to watch her and report back what is going on in the unit. All the lines of investigation they are pursuing in the various cases are interesting. McDermid slowly reveals more clues as the narrative follows Karen's line of thinking and where the cases need to go. It is fascinating to follow along. This is a totally engrossing, excellent police procedural which held my attention through the whole novel. It is extremely well-written, evenly paced, and expertly plotted. All the story lines are layered and interesting. Since this is a police procedural we know who the suspects are early on and have the satisfaction of watching the various cases reach some kind of conclusion or end point. The clues and lines of inquiry and investigation proceed at the pace of the investigation, rather than some shocking reveal. While this is the fifth book featuring, don't let that stop you from reading Broken Ground. The characters are well-developed and the needed background from the previous novels in the series is provided to allow you to easily follow the plot. The dialogue feels natural and realistic. Karen is a great character and I liked the tone and pace of this procedural enough to look for the previous novels in the series.